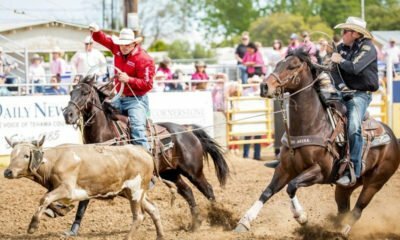 La Fiesta de Los Vaqueros Tucson Rodeo is quickly approaching, and trust when we say this is a great one to attend! Y’all better get ready for one of the most fun rodeo events of the year! La Fiesta de Los Vaqueros Tucson Rodeo is quickly approaching, and trust when we say this is a great one to attend! Aside from the Pro Rodeo, there will also be a Western Market, Parade, Coors Barn Dance and everyone’s favorite event, the Jr. Rodeo and Mutton Bustin! The Junior Rodeo and Mutton Bustin will be taking place every rodeo day and this will be one you don’t want to miss! Kids ages 5 through 12 will be living out their gold buckle dreams in the same arena as the pros. Come out and watch the next future generation of pro rodeo athletes compete in each timed event! The week-long event will also include an educational rodeo program called REACh. Where children are educated on the sport of rodeo and the benefits it can bring to your life. Schools K-6 are encouraged to bring students out for the presentation that will promote the future of rodeo. Every year the City of Tucson, Arizona has done an amazing job hosting the rodeo. In fact, they have been doing it for almost 100 years! Even after nearly a century, one of the largest reasons for continuing the La Fiesta de Los Vaqueros Tucson Rodeo is to glamorize the western lifestyle. It makes for a great promotion for the sport of rodeo and to show just how hard those Cowboys and Cowgirls work! So come on out and support the young cowboys and cowgirls, the Western Market and the REACh program! It will be educational and fun for children of all ages to understand the importance of our western heritage!